Earthing is essential and important for the safety of human lives and equipment. It has become an everyday term and a very common practice in electrical construction and operation. Earthing is necessary to eliminate electrostatic/ dynamic discharge of electricity and to take care of sensitive equipment. Being the prime requirements it is the most neglected aspect in our housing, industrial and commercial electrical infrastructure. Chemical earthing is considered to be the most effective solution for consistent and permanent earthing. They are maintenance free and have minimum fluctuations and are eco friendly. They are highly reliable for safety of human life and have more surface area of conduction. Uses of charcoal & salt. GI pipe with funnel & hole. More area of space required. More fluctuation in OHMIC value. Eco friendly chemicals are used for longer life. Double pipe with flat technology. Less area of space required. No fluctuation of current & OHMIC value. Imperfect earthing will play havoc with the system and lives of the people. If lightning protection system earth is not proper, in the event of lightning discharge, the lightning protection system will become in effective and this may cause injury elsewhere in the equipment. If the Transformer neutral is not earthed properly, in the event of an earth fault in the system a condition known as “arcing ground” will occur resulting in high voltages. Regular condition monitoring of healthiness of earth and maintenance of earth system ensures safety. In effective earthing in a distribution system may, not only result in life hazards but also may affect metering. If proper standard and effective earthing adopted, it will minimize accidents and maximize the security and reliability and supply. 1. The whole electrical system is tied to the potential of the general mass of earth and cannot 'float' at another potential. For example, we can be fairly certain that the neutral of our supply is at, or near, zero volt (earth potential) and that the phase conductors of our standard supply differ from earth by 240 volts. 2. By connecting earth to metal work not intended to carry current (an extraneous conductive part or an exposed conductive part) by using a protective conductor, a path is provided for fault current which can be detected and, if necessary, broken. International standard IEC 60364 distinguishes three families of earthing arrangements, using the two letter codes TN, TT and IT The first letter indicates the connection between the earth and the power supply equipment. T - All exposed conductive metalwork is directly connected to the earth, independent of any other earth connection in the supply system. The third and fourth letters indicate the arrangement of the earthed supply conductor system. 1. Improper wiring by local electrician. 2. Putting up of higher rating fuses. 5. Not adhering of electrical safety. 8. Lack of supervision during work done by unqualified labor. Such type of accidents can be avoided up to some extent if, design engineer adopt different safety precaution and latest techniques. It should stabilize circuit potential with respect to ground and limit the overall potential rise. It should protect life & property of device from over voltages. It should provide low impedance path to fault current for reliable & prompt operation of protective devices during ground fault. It should keep the maximum voltage gradient along the surface inside & around the substation within safe limits during ground faults. The earthing values now a day due to world of electronic the demand has come to less than 2 ohms, depending upon the requirements of their equipment and safety. For sensitive equipment and under extreme circumstances, less than 1 ohm is required. When designing a earth system, the difficulty and costs increase extremely as the target resistance-to-ground approaches the unobtainable goal of zero ohms. Allow for protective devices activation when there is an insulation fault. equalize the potential of conductive parts that can be accessed simultaneously, with the potential in the surrounding soil in order to prevent people from being exposed to hazardous voltages. Allow the lightning strike energy to be safely dissipated and to Reduce electromagnetic interferences. absorb more moisture from the soil thus affecting its consistency. 2. With the help of auger, Bore a hole of about 6 inches in diameter to a depth of about 8 to 15 feet depending upon the length of electrode. Ensure the electrode is driven and the terminal strip is just below the ground level. 3. Open the backfill compound bag. 4. Take a half bucket of water and pour the chemical inside the bucket and thoroughly mix the backfill with the help of hands. Ensure no granules are left and mixture is properly mixed. 5. Remove tapes and plastic cover from the electrode and place the electrode into the pit. 6. Start pouring the mixture of back fill compound around electrode. Completely empty the back thoroughly mixed with water into the pit. Ensure full bag of chemical is consumed in one pit. 7. Pour water until it comes to the top of the pit. 8. Daily pour the water for about 7 – 10 days for the electrode to set. 9. Make an inspection chamber of pit either of brick and cement or ready made long life high resistive plastic chamber for testing at regular interval. 10. With the help of Earth tester take a reading in three point method after 10 days of watering of pit for stable results. 1. Select a suitable place in around the meter or panel where earthing need to be done. 2. Dig a trench of about 2 feet wide 3 feet long and 07 to 11 feet deep. Make a base by adding soil into the pit of about 6 inches. Water the pit so that loose soil is set in. If required add some more soil. 3. Place an electrode into it to increase the surface area of conductivity. 4. Place the electrode into the trench. Open the backfill compound and place the backfill compound inside and around the electrode. 5. With the help of plastic pipe of diameter 3 or 4 inches inverted over the electrode, fill the backfill into the pipe until it comes to the top of pipe. 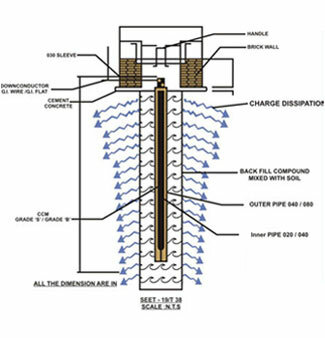 Add the soil into the pit and simultaneously lift the pipe so that compound is retained in around the electrode. Water the pit and again keep filling the pipe with compound. 6. Keep adding the soil into the pit till it comes to ground level. Water the pit for about an hour so that all the loose soil is set in. 7. Ensure the watering of pit is done every day for a week. 8. Make an inspection chamber of pit either of brick and cement or ready made long life high resistive plastic chamber for testing at regular interval. 9. With the help of Earth tester take a reading in three point method after 10 days of watering of pit for stable results. Here we recommend deep earthing of about 50 feet with the help of boring. 1. Allocate a suitable place, and with the help of tripod stand bore a hole of 4 inches into the ground. 2. Put soft soil into the pit. 3. Joint a GI/Cu strip 40- 45 feet long with electrode and place it in bored hole. 3. Pour the back fill mixture into the pit and add soft soil and water into the pit. 4. Ensure the watering of pit is done every day for a week. 5. Make an inspection chamber of pit either of brick and cement or ready made long life high resistive plastic chamber for testing at regular interval. 6. With the help of Earth tester take a reading in three point method after 10 days of watering of pit for stable results. The soil properties of the ground are characterised by the earth resistivity. Its value is often a complicated task. The ground does not have a homogenous structure, but is formed of layers of different materials the resistivety of a given type of ground varies widely and is very dependent on moisture content and the calculation of the earthing resistance requires a good knowledge of the soil properties, particularly of its resistivity. Electrical parameters of the earthing system depend on both soil properties and earth electrode geometry. Soil properties are characterised by earth resistivity, which changes over a wide range from a few meter up to few thousand meter, depending on the type of ground and its structure, as well as its humidity. As a result, it is difficult to calculate an exact value of earthing resistance. All relationships describing earthing resistance are derived with the assumption that the ground has a homogenous structure and constant resistivity. Ideally, the earth surface potential should be flat in the area around the earth electrode. This is important for protection against electric shock, and is characterised by touch and step voltages. Rod electrodes have a most unfavorable surface potential distribution; while meshed electrodes have a much flatter distribution. The behavior of the earthing system for high transient currents should be considered. Very high current values diminish earthing resistance due to the strong electric field between the earth electrode and the soil, while fast current changes increase earthing impedance due to earth electrode inductance. The earthing impedance is, in this case, a superposition of both these events.